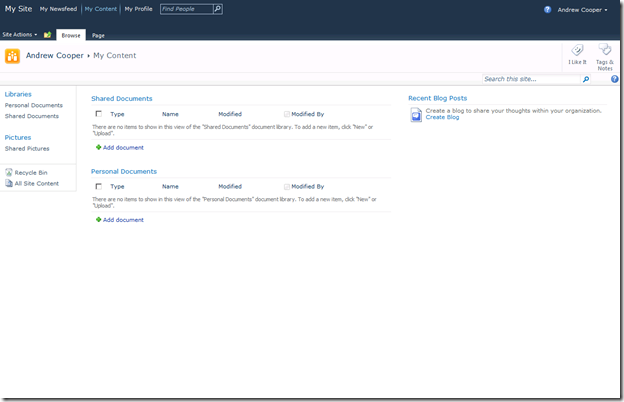 This is the first article in a series which explores the SharePoint 2010 MySite features. SharePoint 2010 has brought with it vast arrays of improvements and several of these are focused around ‘Social’ features. Many of us are familiar with Facebook, LinkedIn and other sites which bring people together to share personal information. 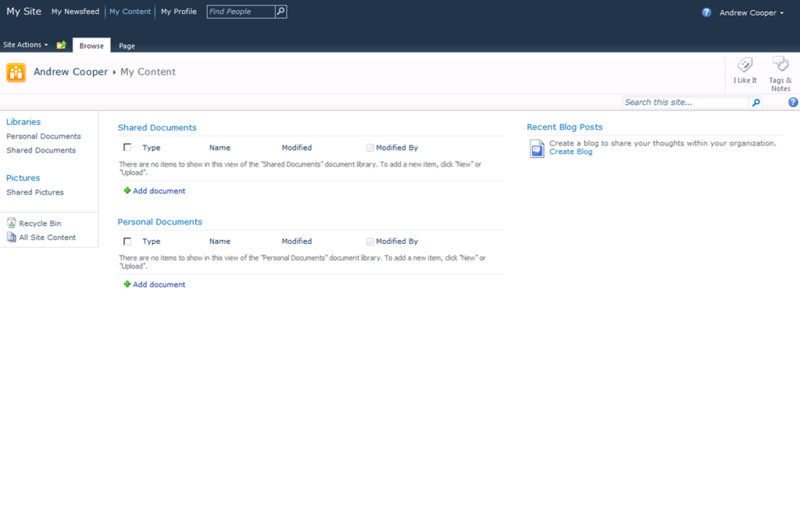 Within SharePoint this is provided by the MySite concept. SharePoint MySites are commonly referred to as ‘Facebook for the enterprise’, they provide each user a personal space to store private and public information such as documents, pictures, status updates, information about themselves and blogs. My Site Web sites are personal sites in Microsoft SharePoint Server 2010 that provide users in an organization with a rich set of social networking and collaboration features. These features give users a way to discover areas of expertise, projects, and business relationship from one central location. Each user can view his or her My Site Web site by clicking the corresponding user name in the top, right corner of any page and then clicking My Site. Why would my organisation use MySites? 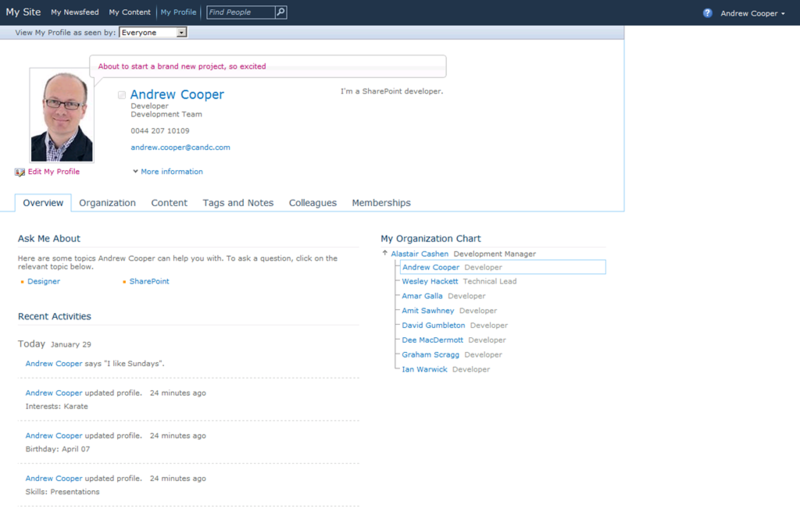 The use of SharePoint 2010 MySites allows users to share information about themselves and their work. Sharing this kind of functionality fits well within collaboration strategies where connecting people and skills together becomes important. A MySite also helps end users feel some kind of ownership of a corporate system, that little bit is all theirs to play with. 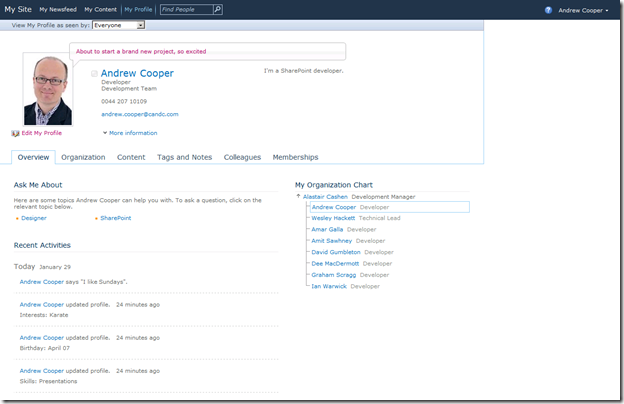 SharePoint 2010 introduces a new social feature to the MySite called the activity feed. This feed is similar in concept to the news stream on Facebook or LinkedIn. It displays activity from your colleagues, such as new tags, changes in profile information, colleagues being added and new blog posts from the user. The my content page is the personal space for the user. This site collection contains document libraries for private and shared documents, pictures which can be linked to Office applications. The main page provides a page where a user can add whatever web parts they need. The user is also able to create a blog site under their personal space to allow others to read about their experiences. 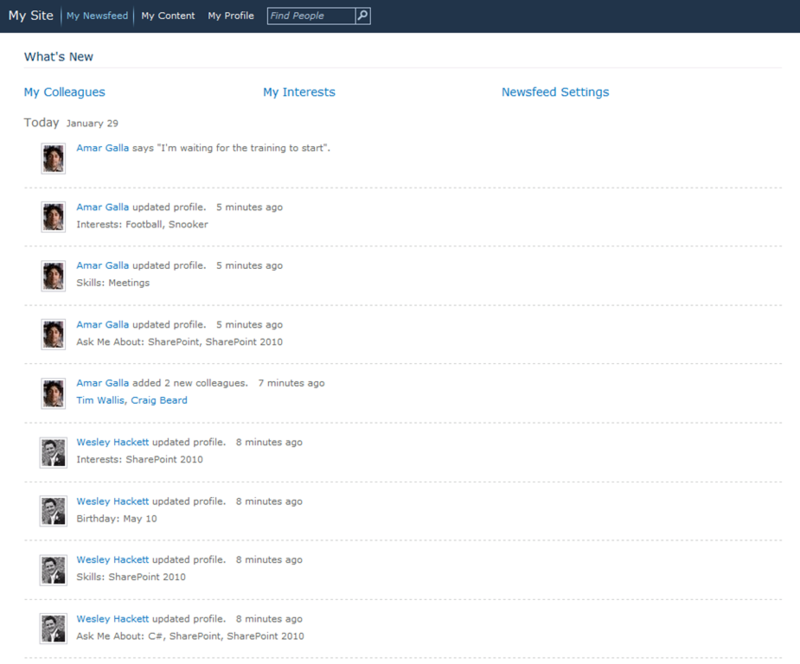 The user profile page displays various information about the person. Such as an introduction, skills, interests, past projects, contact details and personal photo. This information can be sync’d from Active Directory as well as several other sources using the BCS capability. Another feature of the profile page is to allow the user to display different levels of information depending on social distance. For example you can restrict your mobile number to only those users who are colleagues. 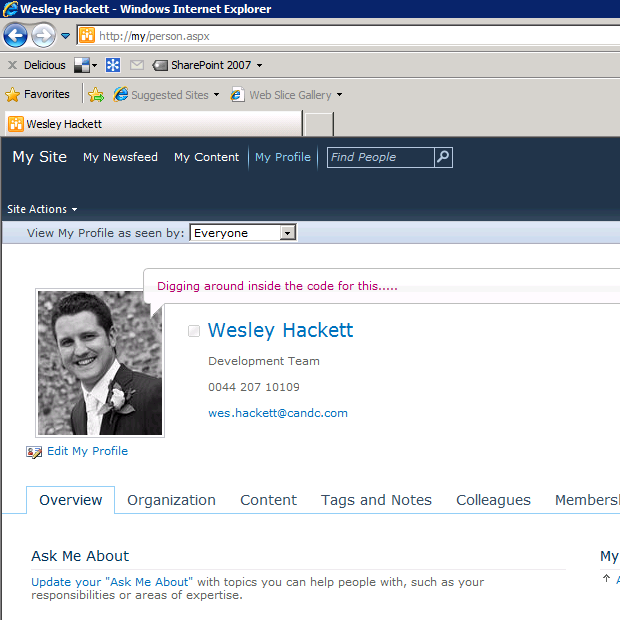 Hopefully this has given you a 1000 foot view of the SharePoint 2010 MySite. In the next article we’ll examine in more detail the features and components that are brought together to build this MySite functionality. Thanks for the great post. I have a quesiton- Is it possible to enable My Sites and only allow the User Profile portion? For now,we want to leverage that feature but disallow the rest. Thanks! This will now mean that users have the ‘Newsfeed’, ‘Profile’ links by no ‘My Content’ so they can take advantage of all the shared features but not create a personal site. Once this is set any user then requesting a MySite creation will get an error message and the site will not be created. Hope this helps 🙂 I think I’ll add this into an article in this series. Can we determine via code if user have permission to create personal site ? Yeah you’ll need to check that self service site creation is enabled and that the user also has access to the MySite host. Thank you for these great posts. I’m looking forward for “The MySite centric intranet, putting the MySite at the centre of the universe”. I’m developing a new SharePoint 2010 solution for my company but I decided to turn off the My Site feature for now. The main reason is because I can’t find a “good” way to integrate My Site with Team Sites (They should be all in one place in my opinion for the final user). Thank you again for your time in sharing all this information. Thanks for this post series. My head is spinning! We have got a query from our analysts about the possibility of using the newsfeed for distributing corporate communications. I assume they want to force something to appear in everybody’s newsfeed. I’m not certain what to make of this. On the one hand it seems to be anti-social-networking. On the other hand, if we could somehow “default” this behaviour and let people opt out of it (by, for instance, adding a preset to their newsfeed “Interests” I think I could handle that. So you can check out my Activity Feed extensions article for some code details about internal mechanics to raise new activity. You can give users the option to ‘opt out’ by using a distinct activity type for this news event. As far a publishing to everyone, that would be the responsibility of the timer job logic. The area to focus on would be getting the MinimalPerson collection to MultiCast the source event. Also you will need to consider who ‘owns’ the source event. So technically it’s not massively complex, from a solution view point I guess it’s down to the client requirement. It does seem reasonable to use the feed for communications, but I would advise allowing a user to ‘opt out’ and informing the comms team that they could. On my solutions I usually work with the internal comms teams to ‘reserve’ space on the user homepage to ensure a user sees the communications that must be seen and then push other news through various other mechanisms. Is it possible to customize the activity feed to the MySite NewsFeed when a new colleague is added? For example, change the domain\userid text to display the DisplayName instead? There is an example in my other article http://weshackett.com/2011/06/extending-the-activity-feed-with-enterprise-content/. The specific section is under the ‘Improving the web parts’ text. Thanks for Gr8 article !! Is it possible to modify the MySite link with MyProfile link and when Myprofile page opened then we should show default tab as Content ? The navigation elements can be modified by editing the navigation of the MySite Host site collection. And to get the content tab to show look at the url and you’ll see it is a seperate page so set the node url to that url. The profile pages give the illusion of switching tabs but are in fact seperate pages. Could you tell me can we create mysite in claims based authentication mode? I want to give option for my ADAM users to use the mysite. I was wondering if a user can stick a “colleague” into multiple groups? Please let me know. I think OOTB the colleague can only be within one group. Wes, I’m interested in creating a group of co-workers that reside at various sites around the country. I’d like to use My Site to allow closer collaboration, in spite of the great distances between us. How can I create a group that includes only these co-workers? I would also like to be able to choose a set of key words that help define my skills and expertise such that, anytime someone in this group posts a question or statement containing one of the key words, I will be notified, so I may be able to give some assistance. If I understand your requirements correctly then you could create a ‘team site’ rather than use a single MySite to provide a collaboration site for your group. This team site could use the Team Site template or maybe the Enterprise Wiki template depending on your SharePoint version and the features you need. You can then restrict the site to just those people you wish to have access or contribute rights. As for the skills and expertise question. You can add those to your profile and have the user properties set to publish to the activity feed displayed on the ‘Newsfeed’ page in the MySite host. Then people could use your profile page to ‘ask a question’ on your noteboard. If you wanted a feed coming from the team site then I would suggest using a managed metadata field on the content types and then ‘following’ this term fromt he tag profile page. This will also then show up in your activity feed. Alternatively you could look at a product such as NewsGator social sites which provides a vast array of features on top of SharePoint 2010 one of which is ‘questions’. Is it possible for a team site to display the latest my site newsfeeds, from people in the same team site group that have a my site? If so, how? The native activity feed doesn’t really have the concept of a ‘team feed’ so it is very difficult to provide just activities for that site and it’s users directly. One way you could make this appear is to write a custom web part which reads off the change log and displays the events in the same markup as the activity feed web part. To a user this would feel like a team feed. Its really a good article. But I have an issue. I am not able to see any activities in the My Newsfeed page even after activating Activity feed Job for the user profile service application. All the activities are enabled in Edit My profile page for the me as well as for my colleagues.But same issue. Please help me to get this. Is there anything else to be done? Please visit the SharePoint forums there and post your question. i have a query regarding mysite. Suggested colleague not shown under “View Suggestion” in My Colleague section of mySite. Can u give the possible reason for that? There are several things behind the scenes that may be affecting this. Lync as well as Outlook are used to provide colleague suggestions. SharePoint Server proactively suggests colleagues and displays them in a Suggested Colleagues web part on a user’s My Site. It does this through a number of different features. The user’s Communicator or Lync contacts are examined and are collected from the Communicator client via the ActiveX control (name.dll) for colleague suggestions. The SharePoint Server Colleague Add-In in Microsoft Outlook 2010 scans the user’s Sent Items folder periodically (every 5 days or so, depending on usage) to look for names and keywords along with the frequency of those names and keywords. The list of possible colleagues is updated periodically and stored under the user’s profile on the user’s local computer. 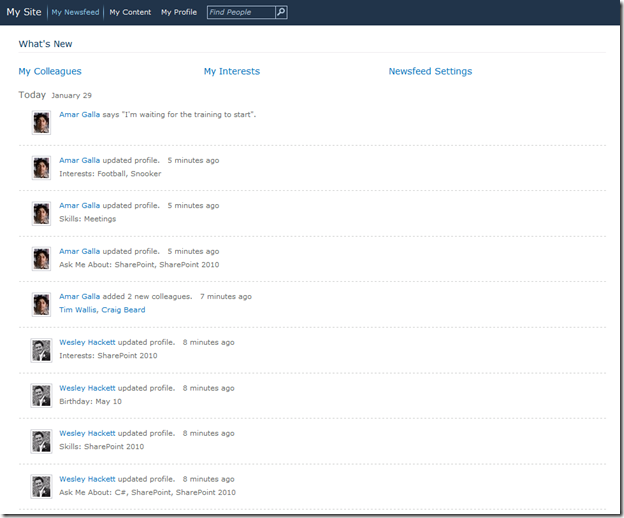 This list is accessed by the Add Colleagues page on a user’s SharePoint My Site through an ActiveX control when you click Suggested colleagues where they can choose the colleagues they want to add to their My Site. The user can approve or reject contact names before they are added. Outlook 2007 supports this functionality but is not as extensive in searching for colleagues. Although you can enable e-mail analysis for all users in Outlook or only for specific groups by using Group Policy, users can opt out of this feature. If e-mail analysis is disabled for all users, individual users can still opt in. Also, you can choose not to install the add-in as part of the Office install. More information about configuring the add-in can be found here: http://technet.microsoft.com/en-us/library/ff384821.aspx. Thanks for the great post. Not sure if has been already answered…can you do a selected restrict of mysite to users from certain locations etc…I guess using AD. We have employees around the global and we are facing some push back from some of our locations due to the local rules around employee confidentiality. We have a community site, and i posted in that community site with tags specified.. But its not showing in the mysite new feed, when i search with that tags. Neither in the community site also, its not showing any search result, when i click on the #tag. Please let me know what is the issue behind it?